How warm was the world in July, amidst the historic heat waves? Summary: The most accurate source of global temperature data comes from satellites, with their full coverage and more standard sensors. Thanks to the internet we need not rely on secondary sources; we can see the data for ourselves. For analysis, of course, we must rely on scientists. Previous posts have discussed the 2 century long global warming. Today we look at the data and analysis of July’s global temperatures, neither of which well matches the heat wave hysteria washing through the news media. Global composite temperature: +0.28 C (about 0.50 degrees F) above 30-year average for July. Northern Hemisphere: +0.44 C (about 0.79 degrees F) above 30-year average for July. Southern Hemisphere: +0.11 C (about 0.20 degrees F) above 30-year average for July. Tropics: +0.33 C (about 0.59 degrees F) above 30-year average for July. Global climate trend since 16 November 1978: +0.14 degrees C per decade. Compared to global seasonal norms, July 2012 was the coolest July since 2008. Scientist in this debate (and anyone reading the literature) know that the world has been warming during the past 2 centuries. The questions concern the relative weight of the causes, which have varied over time, and forecasts. Especially important is understanding the net effects of accelerating human impacts on Earth’s climate, such as land use changes, and emissions of aerosols and CO2 (which spiked after WWII). Unfortunately the debate in the news media has become a cacophony of politically motivated misinformation, with both sides increasingly becoming anti-science (ie, with a Soviet-like the only true scientists are those who agree with us; the others are evil). Continuation of these trends — both in our impacts on the biosphere and corruption of public debate — will have ugly effects. It need not be so. We can run the public debate better. And the climate sciences need both more funding and better supervision. It’s no longer an academic debate, but a major public policy challenge. More like the Manhattan Project than the human genome project. Here we see current global temperatures — one perspective on this complex subject, allowing comparison with what we read in the news media. In section 3 are links to see other perspectives: the past decade, the past 2 centuries, the past 4 centuries, and beyond. Compared to seasonal norms the coldest spot on the globe in July was the South Pole, where winter temperatures averaged 4.5 C (8.1 degrees F) colder than normal. If it isn’t usually the coldest place on Earth in July, seeing temperatures during the deepest part of the Antarctic winter that much colder than normal might move the South Pole into that spot. By comparison, the “warmest” place on Earth in July was in northeastern Alberta, Canada. Temperatures there averaged 3.43 C (about 6.2 degrees F) warmer than normal for the month. Past monthly data can be found at the UAH Earth System Science Center. This was reposted from the website of Roger Pielke Sr — Senior Research Scientist at the Cooperative Institute for Research in Environmental Sciences (CIRES) at UC-Boulder and an emeritus professor of the Department of Atmospheric Science at Colorado State University (see his bio at Wikipedia). This will be updated as more data becomes available. (a) Different data series over many horizons: Good news! Global temperatures have stabilized, at least for now. (b) The sea surface temperatures back to 1981 (covering 70% of the Earth’s surface; seas are the primary heat sink): the Reynolds OI.v2 data from NOAA National Operational Model Archive & Distribution System (NOMADS). (c) The Hadley Centre Central England temperature dataset: started in 1659, it’s the longest instrumental record of temperature in the world. (d) James Hansen’s (Prof, Columbia – one of the world’s leading climate scientists) website gives a wide range of interesting graphs, including a comparison of the forecasts in his famous 1988 paper with actual CO2 and temperature results. CO2 followed its steady rate of increase, but global temperature has risen less than in any of his 3 scenarios. In 1989 Dr. Roy W. Spencer and John Christy used data gathered by advanced microwave sounding units on NOAA and NASA satellites to get accurate temperature readings for almost all regions of the Earth beginning in 1979. The satellite-based instruments measure the temperature of the atmosphere from the surface up to an altitude of about eight kilometers above sea level. This includes remote desert, ocean and rain forest areas where reliable climate data are not otherwise available. 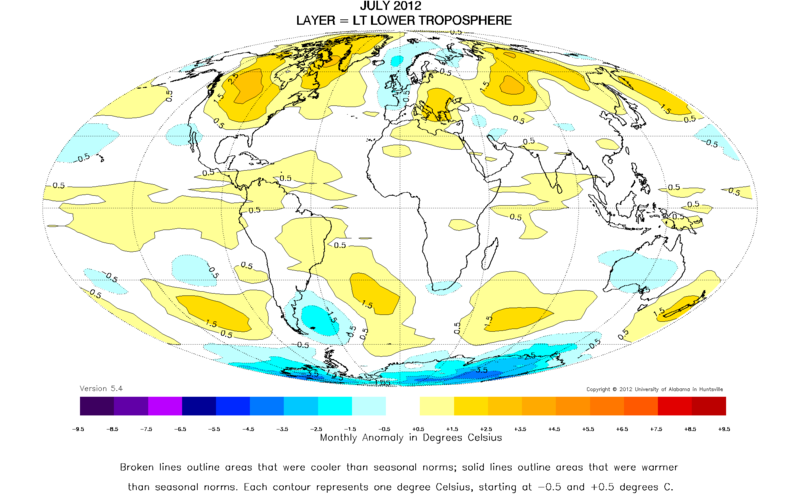 Once the monthly temperature data is collected and processed, it is placed in a “public” computer file for immediate access by atmospheric scientists in the U.S. and abroad. This text was assembled from their websites; see the links in the next section. He is a professor of atmospheric science and director of the Earth System Science Center (ESSC) at The University of Alabama in Huntsville, where he began studying global climate issues in 1987. He received the M.S. and Ph.D. degrees in Atmospheric Sciences from the University of Illinois (1984, 1987). Since November 2000 he has been Alabama’s State Climatologist. In January 2002 Christy was inducted as a Fellow of the American Meteorological Society. He has served as a Contributor (1992, 1994, 1996 and 2007) and Lead Author (2001) for the U.N. reports by the Intergovernmental Panel on Climate Change in which the satellite temperatures were included as a high-quality data set for studying global climate change. He has served on five National Research Council panels or committees and has performed research funded by NASA, NOAA, DOE, DOT and the State of Alabama and has published many articles including studies appearing in Science, Nature, Journal of Climate and The Journal of Geophysical Research. He has provided testimony to several congressional committees. 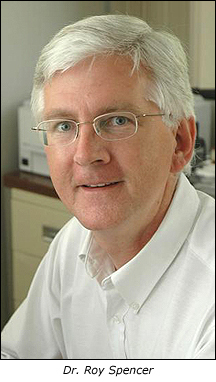 He received his Ph.D. in meteorology at the University of Wisconsin-Madison in 1981. 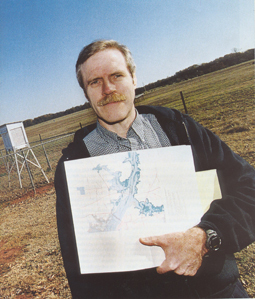 Before becoming a Principal Research Scientist at the University of Alabama in Huntsville in 2001, he was a Senior Scientist for Climate Studies at NASA’s Marshall Space Flight Center, where he and Dr. John Christy received NASA’s Exceptional Scientific Achievement Medal for their global temperature monitoring work with satellites. His work with NASA continues as the U.S. Science Team leader for the Advanced Microwave Scanning Radiometer flying on NASA’s Aqua satellite. He has provided congressional testimony several times on the subject of global warming. Previous Post COINistas point to Kenya as a COIN success. In fact it was an expensive bloody failure. And the skeptics on global warming continue to dwindle in number as research expands and improves the data sets. Its also interesting how federal and state spending is the holy standard in unbiased research when it supports one view, while other public funds purporting another are ignored, not to mention stigmatizing other funding streams as flawed, self serving or political. 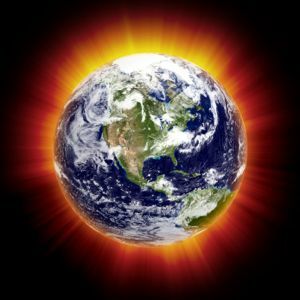 What is a skeptic on “global warming”? I don’t know of anyone in the field who does not believe the world has been warming during the past two centuries, and probably is warming now. Do you have any evidence for that statement? (3) And do you refer to scientists or the general public? Large elments of the public believe so many things that are not so (eg, astrology, no evolution), I suspect changes in public opinion are an unreliable guide to truth. For instance, see this Pew Poll from December 2011: “Is there solid evidence that the Earth is warming?” The question does not specify over what time horizon: one year, 10, 20, or 200. Only 63% say yes, which I find astonishing. By the way, this poll contradicts ahhijawa’s statement. The “yes” vote has been trending down; it was 77% in 2006 and 2007. And a public opinion poll of partisans and those who sell themselves to the highest bidder is not science, its politics, a forum for the expression of biases willfully held or not. (1) I still await your evidence. As in previous comments, you seldom can support your bold statements with evidence. One person changing his mind is not a trend. Esp Muller, who in the past stated clearly that he “was not a skeptic”, and that he agreed with the majority about the dominent role of human-caused warming. He’s changed his public image to “converted skeptic” for reasons we can only guess at. The most common guess is to get publicity. That makes no sense. The Pew poll was a survey of public opinion. Divided, as usual, into 3 segments: GOP, Dems, and independents. Who else is there? It’s natural to believe this, from the publicity following Muller’s op-ed in the NYT “The Conversion of a Climate-Change Skeptic“, 28 July 2012. Brilliant marketing, as he got much more publicity due to his feigned conversion. Let’s play the tape and look at his past statements. Let me be clear. My own reading of the literature and study of paleoclimate suggests strongly that carbon dioxide from burning of fossil fuels will prove to be the greatest pollutant of human history. It is likely to have severe and detrimental effects on global climate. I would love to believe that the results of Mann et al. are correct, and that the last few years have been the warmest in a millennium. (2) His 2009 book Physics for Future Presidents concurred with the consensus view about global warming and human influences. Mueller claims he came to agreeing with the “majority” after completing the 1st phase of the ‘Berkeley Earth Surface Temperature Project.’ And as for Mueller seeking “publicity” that’s not “common knowledge,” that’s conjecture. Yes. Does anyone disagree? What’s your point? You are deliberately misquoting me, even using quote marks. My exact words were “The most common guess is to get publicity.”. This doesn’t create confidence in your credibility. (3) To repeat my previous comment: I still await your evidence. As in previous comments, you seldom can support your bold statements with evidence. All you’ve done is misquote me and change the subject. Where is your evidence that “And the skeptics on global warming continue to dwindle in number”? You have not show that even one skeptical scientist has changed his mind (although some certainly have, as positions change both ways), let alone many. I just want a future that doesn’t involve imminent shocks (or collapse?). I would love to be able to work some hours a week, have MY OWN roof over my head, food in my stomach, clean water to drink, cloths on my back, a miscellaneous thing (i.e-ipod) here and there, and maybe a son or daughter. and I don’t want to have to go $50,000-$100,000 in debt just to get a somewhat better chance at this. I want a small life with a small, productive, local (good paying) job. Is this too much to ask? Or better yet……is this too late to ask?! I feel sorry for you. You live in a society with a level of security and stability unimaginable to any before roughly 1970. War — including atomic war, famines, plaques, devastating natural disaster — these were all routine events to our ancestors, in the sense of (roughly) hundred year events. Even the 20th century, far safer in most respects than anything earlier, we have two mega-wars, the horrific 1918 flu pandemic(more dead than in WWI), several smaller global epidemics (eg, AIDS), and a decade with a disturbingly high risk of thermonuclear war. Now you appear to be despondent over one particular shockwave scenario (of the many existing), one disputed by a large number of scientists. The extreme scenarios which terrify you are considered likely by, so far as can be determined with our limited data, by a minority of climate scientists. Such scenarios have little basis of support in the most recent IPCC reports, which are agnostic about the existence today of *any* human-caused extreme climate events — with the most likely being increased precipitation. Which is of course the exact opposite of the US today, drought. From your comments I guess that you suffer from a fondness for sources which lie to you, feeding your need for horror stories. Accurate information does not appear to help, as it has no visible effect on your fears. We have seen other similar cases in comments on the FM website, like “Erasmus”. As someone with some (a little) relevant work experience, I recommend you consider professional counseling. The doomsters who encourage such fears ignore the long concatenation of factors between the almost-certain increase in C02 (a trace gas, a few hundred parts per million) and catastrophic increase in temperature. Almost every step in that process involves factors that either poorly understood (eg, cloud feedbacks) or disputed. Every month brings more debate in the peer-reviewed literature. This week’s example: “Increase in observed net carbon dioxide uptake by land and oceans during the past 50 years“, A. P. Ballantyne et al, Nature, 2 August 2012. One of the greatest sources of uncertainty for future climate predictions is the response of the global carbon cycle to climate change. Although approximately 1/2 of total CO2 emissions is at present taken up by combined land and ocean carbon reservoirs, models predict a decline in future carbon uptake by these reservoirs, resulting in a positive carbon–climate feedback. Several recent studies suggest that rates of carbon uptake by the land and ocean have remained constant or declined in recent decades. Other work, however, has called into question the reported decline. Here we use global-scale atmospheric CO2 measurements, CO2 emission inventories and their full range of uncertainties to calculate changes in global CO2 sources and sinks during the past 50 years. Our mass balance analysis shows that net global carbon uptake has increased significantly by about 0.05 billion tonnes of carbon per year and that global carbon uptake doubled, from 2.4 ± 0.8 to 5.0 ± 0.9 billion tonnes per year, between 1960 and 2010. Therefore, it is very unlikely that both land and ocean carbon sinks have decreased on a global scale. Since 1959, approximately 350 billion tonnes of carbon have been emitted by humans to the atmosphere, of which about 55% has moved into the land and oceans. Thus, identifying the mechanisms and locations responsible for increasing global carbon uptake remains a critical challenge in constraining the modern global carbon budget and predicting future carbon–climate interaction. Coupled climate/carbon-cycle models predict decreased carbon (C) uptake by the land, owing to diminishing productivity and increasing respiration, and decreased C uptake by the ocean, associated with acidification, changes in ocean mixing and increasing sea surface temperatures, within this century. Although detecting changes in regional C sinks is very challenging, several recent studies suggest that C uptake by the land and ocean may already be tapering off or declining. However, diminished C uptake in these studies is often limited to the regional or decadal scale. In addition, trends in sink intensity in these studies are inferred from satellite measurements, simulated using models or estimated on the basis of inventories of existing C sinks. Thus, their implications for long-term variation in the global C budget remain uncertain. Here we focus strictly on global-scale observations provided by atmospheric CO2 measurements and CO2 emission estimates, and include the full range of uncertainties in each to estimate changes in global C uptake during the past 50 yr. Although this ‘top-down’ approach does not provide the detailed process-level information of previous studies, it does provide an unbiased assessment of changes in global C uptake. professional counseling is too expensive, but dont feel sorry for me brother. I’m fine, I promise. It’s just that your non-professional, speculative, authoritative analysis/perspecive is………well, it’s not so great. I’d love the abilitly to not care, but – go figure – it’s part of my humanity; who would’ve thunk huh?. Oh, and aren’t you wealthy, or would “well-established” be better to describe your current lifestyle? There’s a little word I like to use often: it’s called empathy. You have to put yourself in others shoes before you can understand what’s really going on. Like most republican/authoritative information sources; you are too far removed from us “peasants” down here. I say this with the utmost respect. Please give us some examples. The climate science posts are almost totally quotes from top-ranked climate scientists — like this one. Ditto, though to a lesser extent, the ones about economics. I don’t see the basis for your statement. (2) More broadly, your comment screams “FEAR”. I don’t know what you consider an appropriate empathic response. In my experience when things get to that level, some help is useful. That’s the empathetic and helpful response, IMO. Church, temple, or whatever you attend (if any) might be a source of help. In many states there are inexpensive counseling services. Perhaps a trusted relative or friend. Humoring your apparently burning fears (you didn’t respond to my comment putting them in context, sop with your replies to factual data) seems unlikely to help. If instead you want sympathy, there are hundreds of websites well-stocked with doomsters exchanging myths and rumors. Another interpretation, which I’ll not make, is that professing these fears is entertainment for you. Much like the pleasure some people get from watching horror movies. But not something you in fact take tooseriously. We can only guess at such things, and as sop I take people’s at their face value. An alternative perspective: perhaps you were talking about the US and world economy, and posted this on a climate thread w/o meaning to talk about climate. That’s a different context entirely. Context is everything in these matters. This downturn has put a large fraction of Americans too close to the edge — and has been far worse in Europe. The human cost of this downturn, and the response of governments here and there has been too Hooverite. And this might not be over, yet. We might have another downturn ahead of us, this one starting from weakness. The human cost is high, and might get higher. I feel for the casualties, and most of us are potential casualties in these times. I have written about this cycle since 2007. As you can see in the comments, most — until the past year or so — comments disagreed with my warnings. ESP note those in 2008, when we still could have avoided this. Brutal hostile disagreement, mixed with insults. Scores of that on each post. Hundreds and thousands during the year. Most met with data, citations, and quotes of expert analysis. In my small way I’ve fought in the trenches, vainly. I write about public policy matters — economics, war, climate, pollution, etc — from a cold, dry, technical perspective because that is one way to cut through the fog preventing us from seeing and understanding what’s happening. It’s not the only method — an appeal to fellow humanity, to fellow hearts and souls, also has a role. Everybody does what he or she can, pulling on the rope along with everybody else. What method will work best? I’ll leave that to people in the higher pay grades. lets see some radical change. It’s what everyone’s waiting for: something new, something fair, something equal, something good. People voted for change in 2008. I said at the time that they were not deceived as much as fooling themselves. Hope is not an option. When we decide to make things change, there will be change. I might write about this today. What I see in the comments on the FM website and elsewhere are people who have locked themselves into tribal mindsets. Strapping blinkers on themselves, strapping on harnesses — as in the service of their “tribe’s” (left or right) leaders. We wear the gear well, are so docile and easily led. The left deludes themselves with apocalyptic fantasies, from which only lots of big government can save them. The right locks themselves into faux economics, superstition, and tribal hatred. Then both sides joust to see who can more faithfully serve their masters. It’s a discouraging sight. Oldskeptic’s pessimism has earned him the honor roll position on the FM website’s Smackdown page for his rebuttals to my optimism. I suspect he will earn more in the years to come. On a brighter note: the comment pages are filled with long debates about torture — the need to cut-off food stamps, medicaid, and unemployment insurance to the unemployed — to brutally kill our way to victory in Iraq and Afghanistan (including one about the need to take no prisoners!). There are a very small number of people who posted comments in support of civilization on those threads. I know who you are, and you have my respect and thanks. I hear ya mr. Maximus. Maybe I was a little too rough in my comments; you seem like a good guy. I can see your concerns through your cold, dry, technical perspectives. but the world isn’t cold, dry and technical. Try and put yourself in another’s position to truly understand their perspective. Yes it is. That’s not all of the world, but it’s part of the world. Empathy does no good when the engines quit at an altitude of 40,000 feet. I have probably answered 15,000 comments during the past five years. An insanely large number have been like yours above. I post consisting of a long quote from an authorative scientist, plus data. People like you and ahhijawa dismiss him (or her) contemptuously. Like the crowds have mocked scientists throughout history (sometimes the scientists were right, sometimes wrong – but as a process science is more reliable than crowds’ ignorance). I have dozens, perhaps hundreds, of such examples in the comments. Considering the stakes for us all, that’s an attitude for which I no longer have sympathy. I’m not dismissing anybody’s claims. I don’t have the time to do the deep research needed to dismiss anybody’s claims on climate change especially. One side is wrong, one side is right. Its going to be interesting to see which side read the data right/right data. That’s a radical misreading of the debate among scientists. The debate is not about the data — data like that in this post. It’s about the dynamics of climate. The factors are known, but the debate concerns their interrelationship and relative strength. For example for the former: Heat increases humidity. How much? This is the primary driver of warming, since CO2 itself is a trace gas — while water vapor a massive driver of warming. To what degree more humidity increase clouds and provide negative feedback? An example of the latter: what is the role of the solar cycle? This is one of the major frontiers of climate science. Lots of data, as yet poorly understood. I follow your posts quite often but your posts on climate change make me question everything else you post about. You just sound silly when you say things like “July 2012 is the coolest July since 2008”. We just lived through it, we know quite well how much hotter than usual it was for days on end. Now, I know you will respond with great snark as you usually do when someone disagrees with you, but seriously!!! This blind spot about climate change hurts all your other arguments. I look at them and say if he can manipulate what is clearly evident then what else is he manipulating that I don’t know enough about to spot. I will stick with Dr. Hansen, thanks. (1). The text to which you object was clearly presented as written by Prof Christy. His bio was appears in section 5. Not mine. Please direct your rebuttal to him. In the future please read the text more carefully before objecting. Such errors might be the reason you disagree with their contents. That’s an extraordinary claim, that you can can personally measure the global temperature now vs past years — doing so even better than experts using global satellite data. It is not, however, a claim I will debate with you. Climate Science is not a spectaor sport — entertainment like football games — in which we root for “our” favorite team. It’s a serious issue, with large consequences. We can observe scientists at work but ultimately their work will answer our questions. Our cheers will have little effect — nor should they. The Samsung Galaxy Tab S tablet is also available for $249. 6-inch touch screen display and comes with Touch wiz 2. These handsets include many some new and some upgraded models of available Samsung handsets.